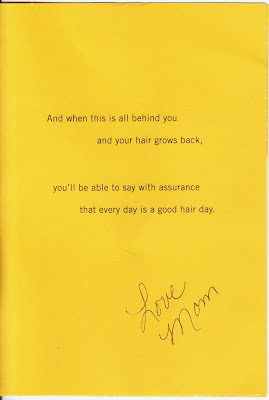 My Mom sent me this card this week. Having my hair come out in clumps was quite disturbing at first. Having my head shaved brought tears. Then, I sort of got used to not having to wash and blow dry a head of hair. I basically wash my head and wipe it dry. Still, I am looking forward to those "good hair days" to start. What a great card. 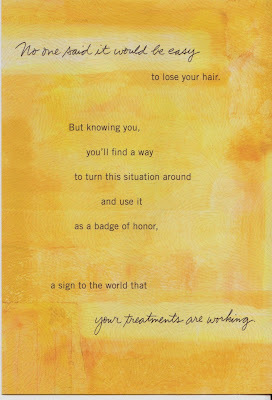 Can't wait to see you with a fabulous new hair style. Overheard At Dylan and Co.